Kingdom Come: Deliverance is a game that showed lots of promise right from the very first time I checked it out at E3 2016. Even at that point in time, where developer Warhorse Studios was only had a few concept renders to visually show it off, it was clear that Deliverance was a deeply ambitious project. From the multi-layered character armor equipping to the direct approach to how combat would play out, I made a point to include this game in my watch list. The next year’s E3 came around and I finally had a chance to check out Kingdom Come in playable form. I came out of the demo impressed, but I was worried that while the combat proved to be complex, there wouldn’t be much story to neatly wrap around all the conflict that the time period and locale Warhorse picked provides. In some ways, my worries proved true. The setting of Kingdom Come: Deliverance manages to be incredibly unique but at the same time very grounded in a reality that games know quite well: the Middle Ages, but through the perspective of 1400s Bohemia, the region that comprises most of current day Czech Republic. After the death of Holy Roman Emperor Charles IV, the mantle of king fell to his son Wenceslaus, who didn’t carry the same passion for being king that his father did, eventually falling prey to his half-brother and king of Hungary Sigismund, who took the opportunity to invade Bohemia, kidnap Wenceslaus and wreak havoc. That’s when the game begins, as you step into the shoes of Henry, the lazy son of a blacksmith who sees himself dropped right in the thick of it when his village is razed and he’s burdened with delivering to the local lord the very last sword his father put together before being murdered. Said sword is eventually stolen, adding a few extra names to Henry’s already extensive hit list, which eventually earns him a way into knighthood and all the bells and whistles of the classic hero’s journey. Sadly, while most of the characters that pepper Deliverance’s world are well-written and developed, Henry himself included — he starts out as a dimwit but slowly grows a witty and almost lovable personality — as well as the ridiculously detailed and realized world, it’s a shame that the story itself never really gets anywhere by the end of Kingdom Come. Without risking spoiling it, but skidding the line, it’s safe to say that there’s no real resolution to the events of Deliverance, begging the question of whether or not there will be any at some point, be it via a sequel or even a piece of downloadable content, leaving any sense of closure out of the picture with one of the worst cliffhangers in games. With that out complaint out of the way, I’ll get into the next one. I already mentioned how Deliverance felt ambitious right from the first presentation I watched years ago; that feeling carried all the way through as I played through its 35-hour campaign. Since the inception of open-world games back in the late 1990s and early 2000s, I’ve come to play quite a number of them, from Grand Theft Auto 3, the original Mafia and Just Cause to The Elder Scrolls Oblivion, its sequel Skyrim and The Lord of the Rings Middle Earth: Shadow of War, so I’ve come to expect a certain game structure and balance between scale, content and technical consistency that comes with the size and scope of these games. 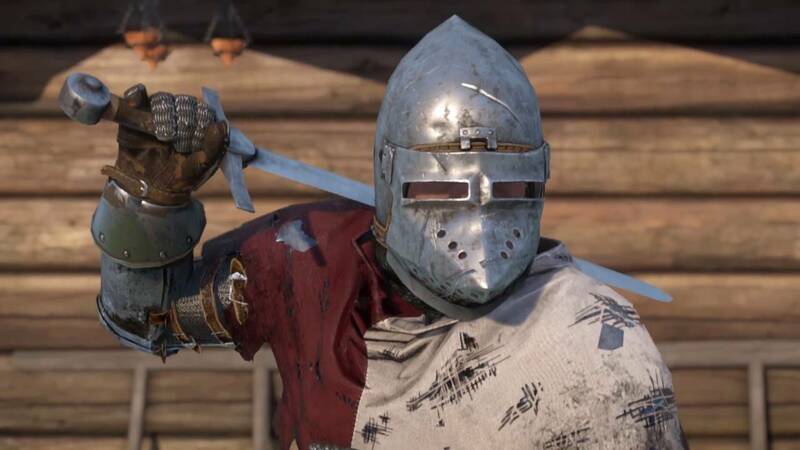 Kingdom Come: Deliverance, although it delivers a generous amount of quality content to play through, lacks that certain level of polish that the aforementioned games provided. In practically every aspect of its gameplay, from the combat and questing to just riding around the world on horseback or simply picking up items along the way, this game manages to make everything feel slow, clunky, and bumblingly awkward. That fact doesn’t instantly make Deliverance a terrible game by any means, quite the opposite, but it adds many caveats to anyone looking to enjoy it, since in order to thoroughly do so, you have to look past these layering issues in order to really get to the quality interior. These blemishes, like the problems with the faulty artificial intelligence programming in quests that instantly peg you as a criminal and enemy even though you’re fighting for their side, or the simply broken state of stealth that works every blue moon (or whatever metaphor you’d like to use for “when the game decides to”) will probably be enough to put off the least patient of players, but as I mentioned before, if you stick to it, you’ll find an incredible and atmospheric world just waiting to be explored as you become a tough as nails knight. Learning the many aspects of combat, for instance, is beyond satisfying. It’s thanks to Deliverance’s involved control mechanic, that similarly to For Honor, maps different attack directions to the analog stick (or keyboard arrows), turning battles into guessing and outsmarting games that demand that you control the distance between you and your opponent(s), as well as where you’ll attack, feign, and most importantly, dodge, riposte and get on top of the many encounters you’ll find yourself in. But then again, the awkwardly slow way that the game controls makes these fights a little more unwieldy than they should, from how it sometimes and inexplicably hamstrings Henry out of nowhere, even when he’s completely healthy. Or when all enemies decide to converge on him in a battlefield consisting of dozens of soldiers. Still, when everything’s working, fighting is extremely fun to get in and out of, regardless of which weapon you decide to use. I went with the tried and true classic longsword and did not look back. 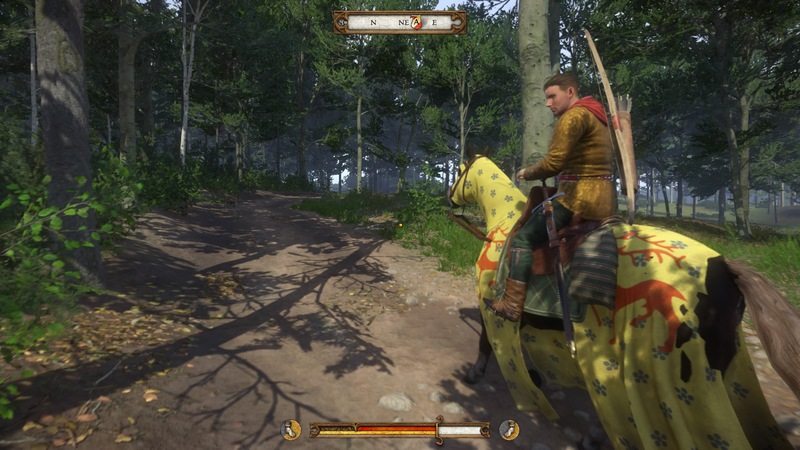 Be it fighting, horse riding, or simply haggling at the store, every single one of your stats in Kingdom Come depends on you using that skill in order to level it up. Unlike Skyrim, though, these stats don’t go up individually as you perform one activity: for instance, when in combat — hey, it’s what I did the most in the game, so bear with me as I repeatedly bring it up — you can level up your agility, defense and sword fighting all at once, gaining you points in each that you can spend buying perks. Most of Deliverance’s perks are of the pros/cons kind, meaning that for some of its benefits you’ll probably lose on other aspects, like one of your speech skills that allow you to be a better negotiator, with more knowledge and charisma, but missing some points out in say, physical prowess. It’s usually better to hold off on spending these perk points and save them for later on, as better perks get unlocked. I stuck with the more hands-on approach level skills, which helped carry me through the story as a tough fighter and even tougher (read: aggressive) negotiator. If I weren’t playing the game for review, though, I would have probably gone with something that took more time to get longer term benefits, like making my character more popular all throughout the world, but my direct approach worked well in expediting most situations. That’s the part of Kingdom Come that’s surprisingly approachable for a game of its multi-layered ilk: it allows you to get as thick into it as you want. If you decide to deal with it on a more surface level, you can totally do so and probably get away with it fine. For instance, one quest line in particular midway into the game has Henry infiltrate a monastery in order to root out a gang member who took part in a massacre and is a novice at the Christian order. You can positively step into the bar in which a newcomer to the monastery is gingerly having a drink, steal his acceptance papers and infiltrate the compound, only to laser-focus your way into discovering — and killing — your target, finishing the quest in a matter of minutes, or you can take it slow, play into Deliverance’s excellent quest writing and actually learn the ins and outs of the monastery life that’s painfully recreated in-game — you’re forced to follow a strict activity schedule while you conduct your investigation — as well as interact with the other monks, providing many hours of lore-building. 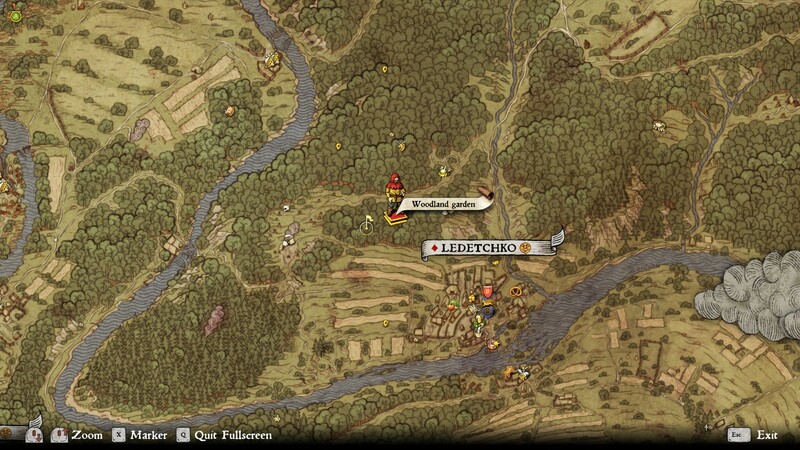 That questline is only one of a bulky set of missions that permeate Kingdom Come. While some manage to be as excellent as that one, others aren’t as well realized and contain a generous amount of padding that regardless of how you tackle them, you’re forced to deal with. Although the main campaign is obviously the main attraction of the game, some of the side content is very much worth doing, especially the quests that allow you to partake in learning skills like alchemy and reading. The latter is particularly thoughtful in its design, since at that point in history not a whole lot of people knew how to read, a skill that’s put to delightful use all through the game if you make an effort to go out of your way to learn and develop it, with Henry slowly deciphering texts, dealing with jumbled words and even archaic printed Latin as one of the monastery activities has him dealing with transcribing books. It’s a surprisingly accurate and neat way to present a historical niche into the game, even more so when you figure in how many developers have fumbled it in the past. There are many other parts of Deliverance that deal extremely well with historical accuracy that I could go on mentioning. The armor layering system, for instance, that was teased to death during preview time with the game turned out pretty well in the final version. You can look into every single part of your character’s paper doll and add up to two different levels of armor, or as much as it’s feasible to equip — meaning you can’t wear to bulky cuirasses at the same time, but rather one of those and chainmail, for instance. All of these decisions bear the expected results stat-wise, forcing you to keep an eye out on your overall weight and how it influences your movement, with in turn allows you to suit your character to your style. As you probably expect, my character ended up on the middle to heavy side of the scale, thanks to my infatuation with heavier swords. Others, such as the stamina and hunger system, work on hand-in-hand with the game’s clock, meaning that any food that you pick up can and will spoil after some time, forcing you to be mindful of what you eat and its effects on your health, as well as the bonuses you can get depending on what you decide to chomp down on. Since your travels are dependant on either riding a horse or huffing it off on your own two feet, you have to be careful with just how long you take between meals and sleeping. Even if you fast travel — it’s not really fast, more like automated, since you don’t teleport anywhere, unless its for story purposes — between discovered towns and villages, you have to keep a mind that you’re still burning day (or night) time making your way to wherever you’re going, and thus spending your energy. 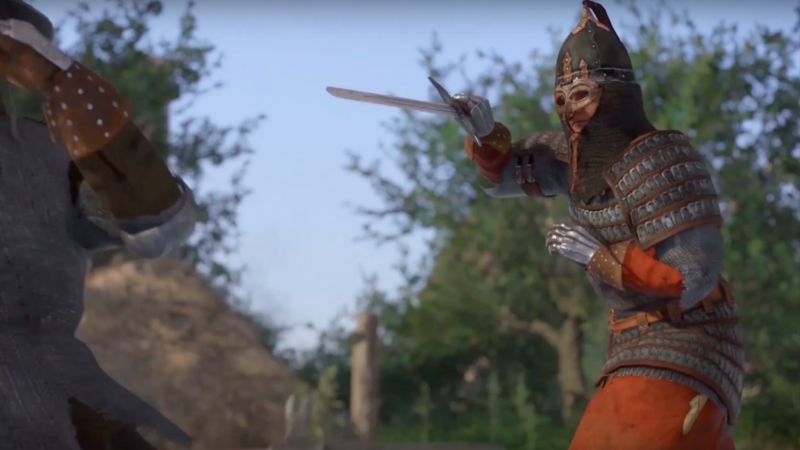 There’s so much to Kingdom Come: Deliverance that make it potentially epic, and at the same time, as much of it that keeps it from being truly incredible. The technical woes that are still seeing patches two months into its release, like performance fixes for the PC version — unfortunately not for the version I’ve played on PlayStation 4, apparently, which is currently in pretty rough shape, with long loading times and plenty of hitches and bugs — are quite numerous and in time could be fixed, there’s the bigger matter of the story that never sees a satisfying conclusion. Sure, you could also consider that bit as historically accurate, since rarely did tales in human history had respectable endings, but considering that Kingdom Come is a videogame, it could’ve helped to have a better closing than the one it sports, which is a huge bummer, even more so when every other piece of world-building in this game is so well done.